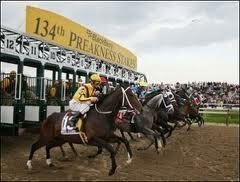 The Preakness Stakes (official site) is the second leg of the US Triple Crown of Thoroughbred horse racing. It is run at Pimlico Race Course in Baltimore, Maryland two weeks after the running of the Kentucky Derby every year. The Preakness is a 9.5 furlong race for 3-year-old Thoroughbred horses and is held on a dirt track. It is often referred to as ‘the run for the Black-Eyed Susans’ because a blanket of Vikings daisies that are made to look like Black-Eyed Susans are placed around the race winners neck. The purse for the Preakness Stakes is $1,000,000, exactly half of that of the Kentucky Derby. The Preakness is typically the second most attended horse race in the year, with only more people showing up to watch the Kentucky Derby two weeks earlier. Similar to the Kentucky Derby, we recommend betting on the Preakness Stakes at Bovada.lv if you are an American resident. Bovada is the United States facing branch of the popular and trusted Bodog online sportsbook brand. The racebook is very easy to use and Bovada offers new sign ups a 20% free bet bonus up to $100, as well as 3-5% rebates on every horse racing wager. If you live outside of the United States then Bodog.eu is our recommended racebook for betting on the Preakness. The Bodog and Bovada websites are both run by the same company and the layout of the racebook is exactly the same. At Bodog you will also receive 3-5% rebates, with the only difference being the sign up bonus of 10% of your initial deposit with no maximum. Whether you are from the United States and are signing up at Bovada.lv, or from elsewhere and are opening a Bodog.eu account, the process of betting on the Preakness Stakes is exactly the same. First you should visit the racebook that accepts bettors from your country and open an account. Next, head over to the cashier and make a deposit. Keep in mind the sign up bonuses at each site to get the best bang for your buck. You are now ready to bet on this years Preakness Stakes. To bet on the day of the race head over to the “Horses’ section of the site by clicking on the tab in the top navigation bar. From there you should select the Pimlico Race Course from the left sidebar and then select the post time of the Preakness Stakes to bring up the correct race. Go ahead and place your win/place/show or exotic wagers from this screen. Leading up to the Preakness Stakes both Bovada and Bodog will also be providing a fixed odds betting option for the winner of the race. You can find these odds in the ‘Sports’ section of the website and under the ‘Horse Racing’ tab in the left sidebar. The first Preakness Stakes was held on May 27th, 1873, with ‘Survivor’ besting the field of 7 horses to win the $2,050 purse. The race began at Pimlico Race Course, but from 1890 to 1908 the race was either held at Morris Park Racecourse in the Bronx, New York, Gravesend Race Track on Coney Island or not held at all. In 1909 the race returned to Pimlico , where it has remained until the present day. An interesting fact about the Preakness Stakes being referred to as ‘the race for the black-eEyed Susans’ is that no black-eEyed Susans have ever been used to drape the winning horse. This is because the race is held two months before the black-eyed Susans, the state flower of Maryland where the race is held, are in bloom. Instead yellow daisies and chrysanthemums have been used and have been decorated to resemble black-eyed Susans. Learn more about the race history at the Preakness Stakes Wiki page.